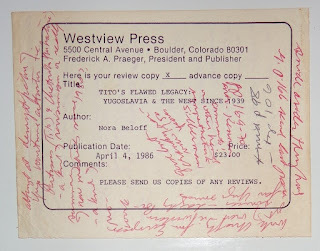 Review slips or letters from publishers often accompany review copies of new books they offer to booksellers. 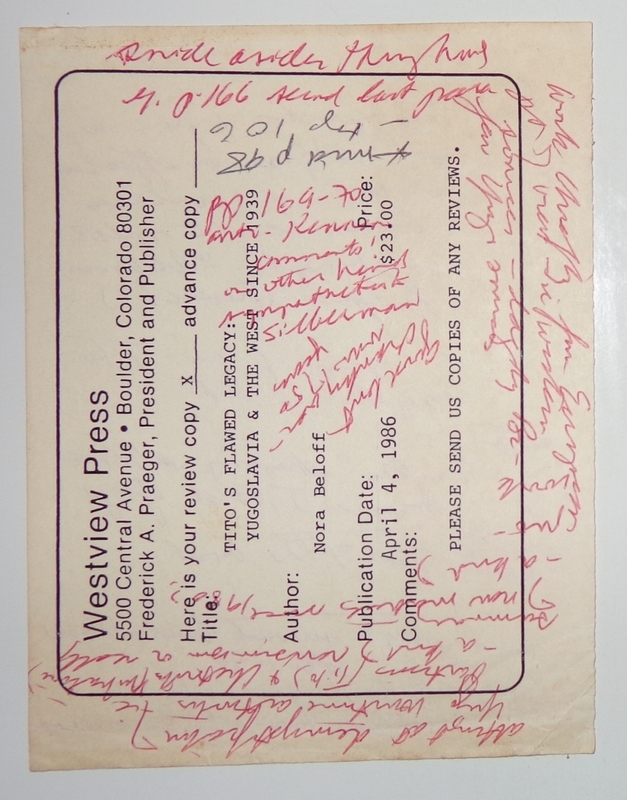 I usually find them tucked inside the front cover (example here), containing language that states the bibliographic details of the book, expected publication date, and a request to send reviews to the publisher. The American Booksellers Association refers to this as Advance Access on their Web site. And when I find them they exist as originally sent, as they are not forms to complete. Rather, they provide contact information for sending reviews. Not so the one below, which I got a kick out of because it appears the reviewer intended, for some reason, to recycle the request itself into a review of sorts or at least a notepad for later transcription into a proper and separate review piece. 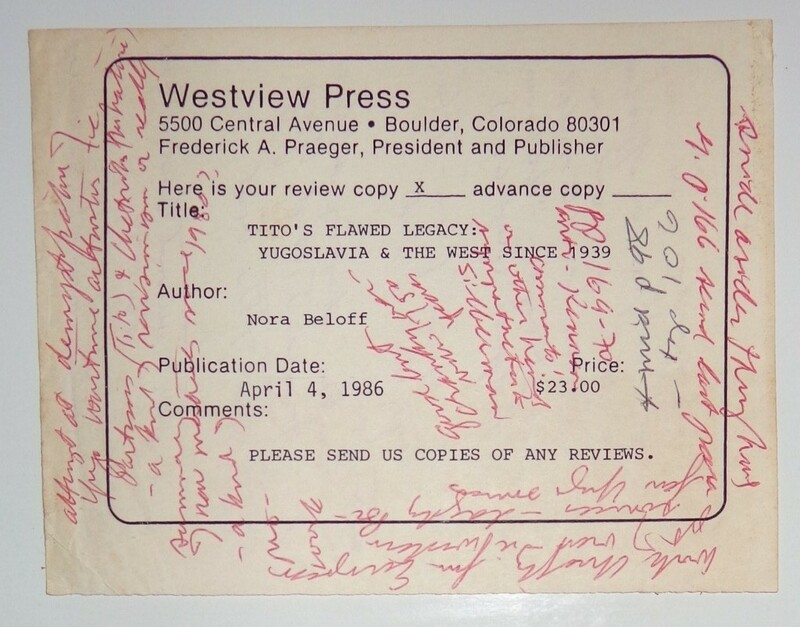 This 1986 review copy of Tito's Flawed Legacy: Yugoslavia & the West Since 1939, by Nora Beloff included a review slip from the publisher, Westview Press (Frederick A. Praeger, Publisher) requesting copies of any reviews of the book. 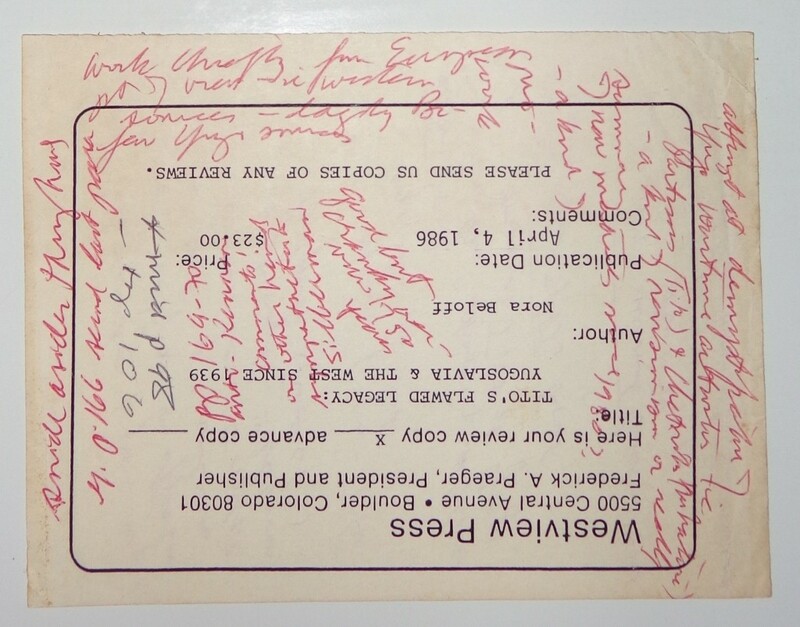 The reverse side was blank. But not for long. 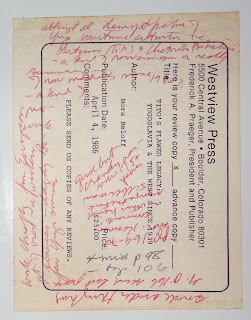 Working around the margins in a clockwise fashion and then in the center, the review, if that's what this scribble is, uses most of the available real estate on this 4 x 5.5-inch slip of printed paper. Flipping it over, page references continue the notes or review, covering the entire backside. 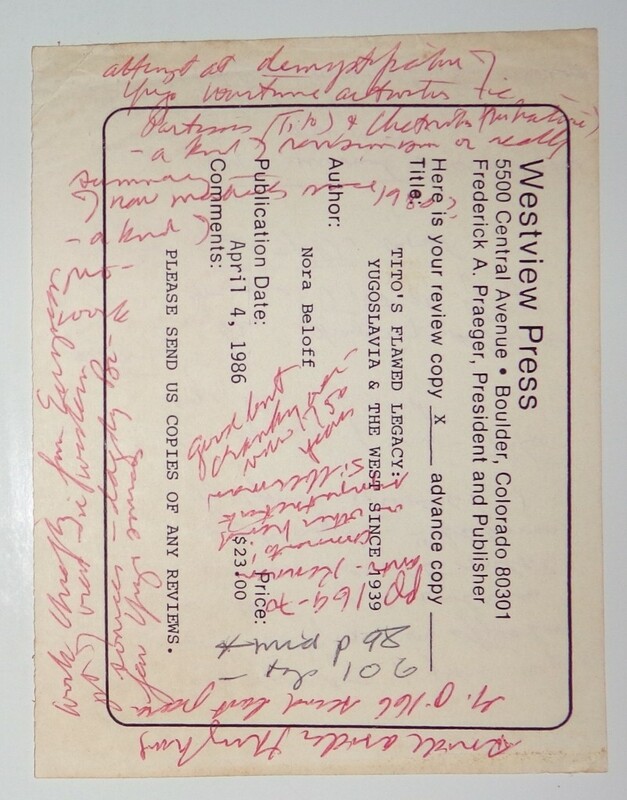 I can't make out any of this, save a few words, but here is the sequence I would suppose someone at the publishing house would have had to read had this piece actually been sent in. Impossible to know if these notes made it to the publisher in some form. The only thing I can say for certain about this is that it was put back in the book where I found it a quarter-century later. I wake up one day knowing nothing about an old, private Roman Catholic women's college in Chicago called Mundelein College. Never heard of it. Within hours, the defunct college, its library, and once-great collection of books are at the forefront of my thoughts and research. 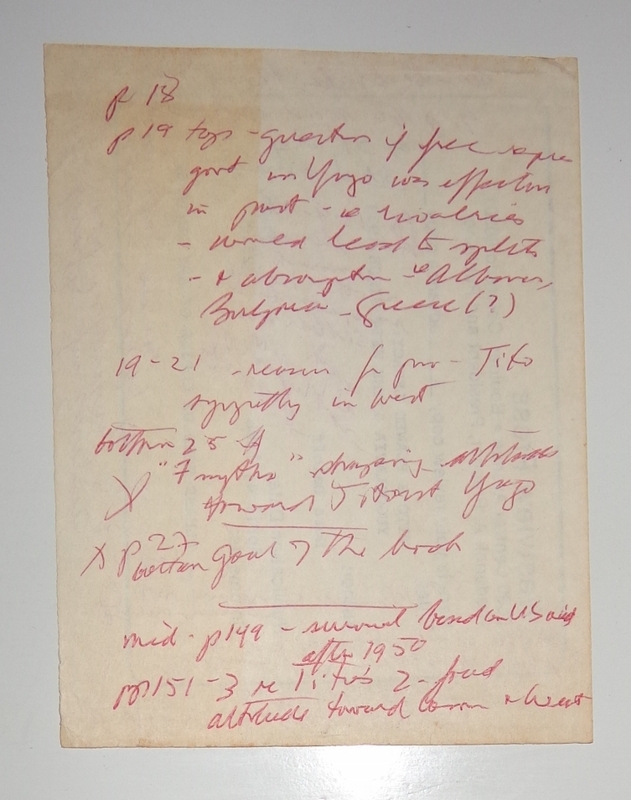 That morning, I find in a second-hand shop a beat-up, damaged copy of Pope Leo XIII's Memoir, Life of Leo XIII: From an Authentic Memoir (1896), which introduces me to Mundelein and an interesting and benevolent bibliophile that helped shape their library. The old book's covers are detached, it's falling apart, and a rubberband holds the pieces together. Still, I must look inside for hidden treasure and I am rewarded for doing so. 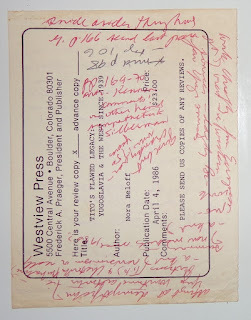 I find pasted on the marbled endpaper a bookplate from Mundelein College, specially designed to acknowledge the gift of a man identified as Rev. John Rothensteiner. Back home a bit later, I research Mundelein College, which no longer exists, and its connection to a man named John Ernest Rothensteiner. I learn more about Rothensteiner's extensive and very impressive book collection and how he ended up giving some 20,000 volumes to a small upstart of a college in need of a library. All this, and more, I begin to learn thanks to a worn and broken copy from that collection, which somehow traveled a thousand miles south to the University of Houston's library and later deaccessioned into some individual's hands and ultimately into a resale shop, where a blogging bookseller picked it up and found another story besides that of Pope Leo XIII. More research produces fragments of information that reveal Rev. John Rothensteiner was not only a man of the cloth, he was also a poet, historian, writer, scholar, and, as mentioned before, a bibliophile. He wrote a history of the St. Louis Diocese as well as German lyrical poetry. His interests were diverse, but I want more information about his book collection. I turn my attention to online booksellers and in seconds I find and purchase a copy--the only copy available--of The Rothensteiner Collection, a bibliographic booklet published in 1933 by Mundelein College Library. Within a few days I have it in my hands to peruse. 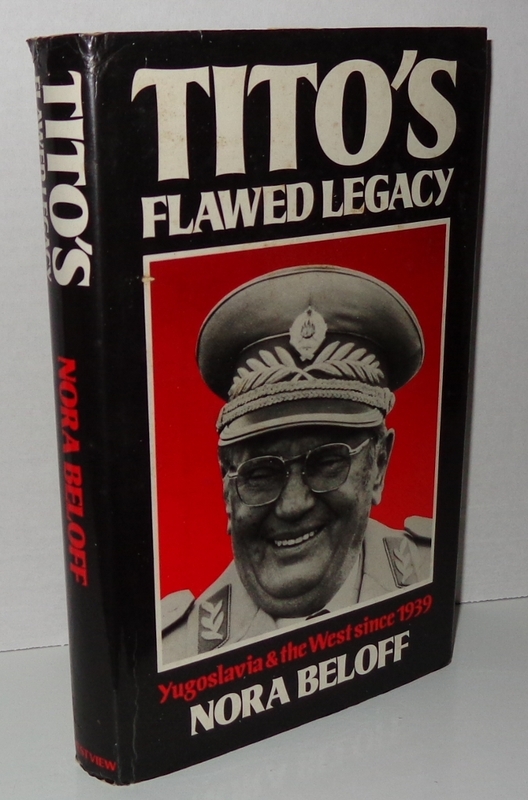 It's covers are detached as if in solidarity with those of Rothensteiner's Life of Leo XIII. And, as with Life of Leo XIII, suspending judgment of the cover of the Rothensteiner pamphlet yields a rich history. To begin with, in addition to an annotated listing of the highlights of the collection, there is history on Rothensteiner, including an image. 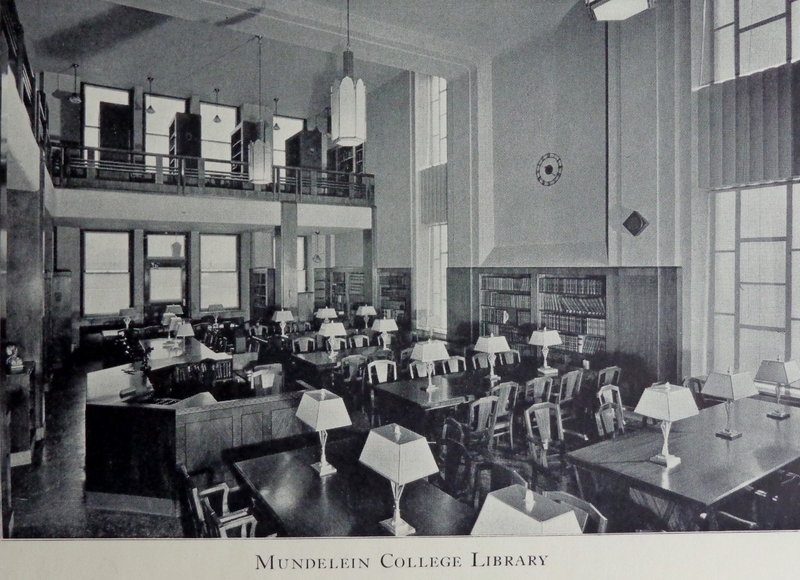 And there are images of the college and inside the Mundelein Library. The foundation of the library's holdings begins with the foundation of John Rothensteiner and his love of books. 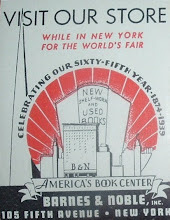 The author of the booklet states that Rothensteiner was "a born book-hunter," having grown up frequenting the book shops of his native St. Louis and Milwaukee. He developed an early appreciation for fine and rare books. I'm reading this and wondering how a boy, and later a young priest, could afford to purchase fine and rare books. Perhaps there was money from his father or perhaps he was very adept at ferreting out a rare volume here and there from booksellers who didn't know or appreciate what they had. 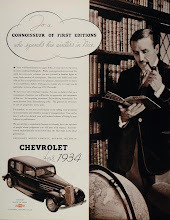 His scholarly pursuits fed into his book collecting and vice versa. He trained in the classics at Milwaukee Seminary. Afterward he studied philosophy and theology before entering the priesthood in 1884. Accordingly, the Bible and works of the founding fathers of the church became a specialized field of collecting for Rothensteiner. Folios and quartos held a special attraction for him. His books would become his reference library that he used for writing many books and articles for literary and theological publications. He spent twenty years in Fredericktown, Missouri before being transferred to St. Louis. His growing collection went with him and continued to grow. In his 73rd year, he learned from an acquaintance about plans for Mundelein College and an idea came to mind about how to help a small college get its library started. His books went to their new home a few thousand at a time. 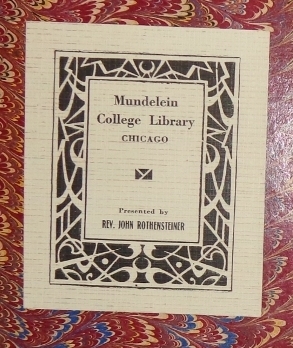 By the time of this publication, a year or so after Mundelein opened, Rothensteiner had parted with 7,500 books. Mundelein instantly had a bibliophile collection and working library consisting of theology, philosophy, patrology, classics, history, French, Spanish, German, and English poetry and prose, essays, letters, art, travel, and rare and curious. 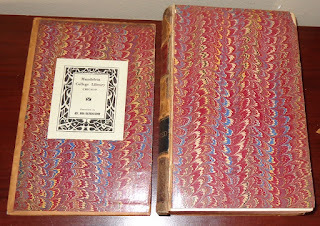 After the brief history of Rothensteiner and his books, the donated collection is described in relation to the evolution of the book and printing. From the early history of books there's a fragment of an ancient manuscript, a Catholic antiphonary. There are also two authenticated volumes of Incunabula, early examples of books printed with movable type before the year 1500, and each is described in bibliographical detail and with provenance. High spots from the sixteenth century are described, as are books related to the great printers descended from Gutenberg and Fust. These books would include the works of Aldine, Plantin, The Stephani and Gryphii, Elzevir, Foulis, and Bodoni. And again I'm wondering how a priest of seemingly limited means, could amass a collection of museum pieces. 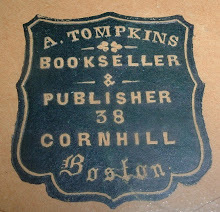 Prices in his day were a far cry from what they are today, granted, and he did generate income through his writing. Still, I wonder. Perhaps in his time, such a collection could be achieved without a great amount of money. Not so today. The library booklet segues next into a roll call of its finest by specific subject, and there are many. 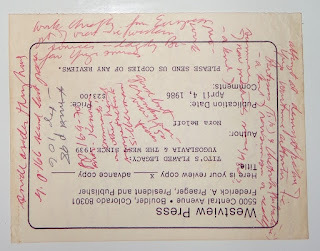 A note on bindings to be found in the collection concludes the booklet. 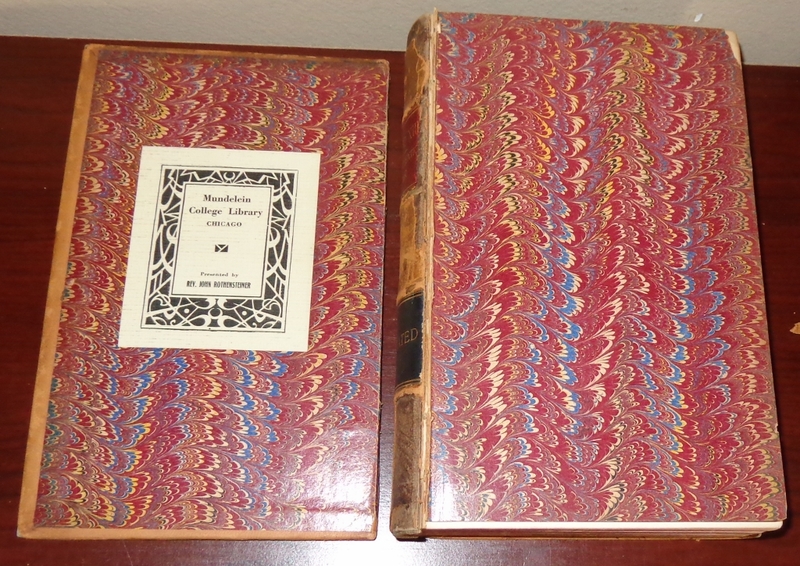 I learn from other online sources that Rothensteiner died in 1936, so the remainder of his collection made its way to Mundelein in short order between 1933 and his death. The college itself died from lack of enrollment and funds in 1991 and was incorporated into Loyola University in Chicago. Learning that, I contemplate what happened to the library. The answer appears to be in the Newberry Library in Chicago. The preceding link indicates that the Rothensteiner collection resides there. Minus a Pope Leo XIII memoir and probably a few other titles. 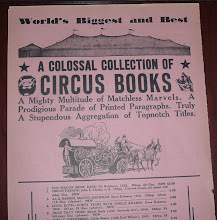 There's also mention of a second catalog that came out in 1941, an update of the rare and valuable books in the collection. 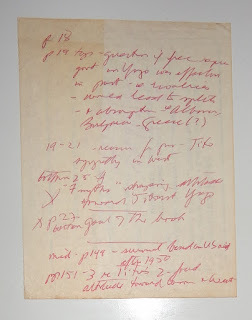 I did some genealogy research at the Newberry Library about 20 years ago while on a business trip to Chicago. It's an impressive library and I'd love to visit again--this time to hunt down some of the old Rothensteiner collection and see some of the rare volumes first-hand that I've been reading about.